Tentative ID. I had the same impression before seeing Paul's comment. It matches the original description and MPG images of spread specimens. 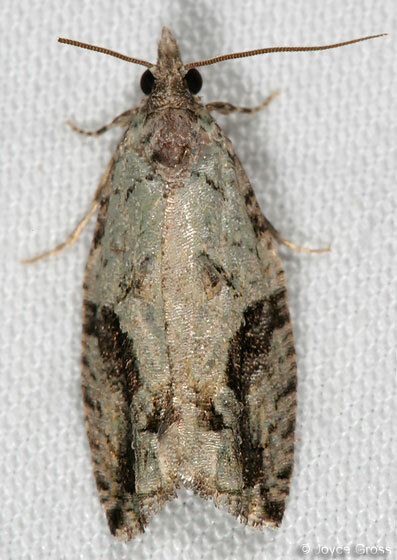 The wing shape and long palps strongly suggest Epinotia for this one. What about Epinotia fumoviridana? ... closest I can get for now, if that is the correct genus. I've moved this to Tortricidae for now. Thanks Bob. Hi, this looks like 3233 -- Black-crescent Proteotoras Moth -- Proteotoras crescentana, or 3235 -- Gray-flanked Proteoteras Moth -- Proteoteras moffatiana from MPG, but I'm more inclined to say 3233.